Ernie oversees FairlawnGig as well as Fairlawn’s Department of Public Service. “Ask Ernie!” is your opportunity to find out more about FairlawnGig and how to get the most from it! Post your questions for Ernie on our Facebook page or submit your question here. NEW! How can I stream Game of Thrones "LIVE?" While I'm asking how do I see the playoffs live as well? Game of Thrones is back for its final season and we’ve had several questions about how to watch the series LIVE. Of course, you can subscribe to HBO through a myriad of services including Hulu, Amazon Prime, DirecTV Now and HBO’s own HBO Now to name just a few. We may not have a local team in the fight, but the NBA and NHL playoffs are upon us! There are countless ways to stream games including YouTube TV, Hulu, Sling TV, and many others. Specifically, the NBC Sports app is the home for most NHL games from here to the hoisting of the Stanley Cup. NBA playoff games are found on ESPN, NBA TV, TNT, and ABC. We recently added Smart TVs to our basement and master bedroom and they don’t seem to perform quite as well as the one in the living room – am I doing something wrong? It sounds like your Wi-Fi isn’t effectively reaching to all areas of your house. FairlawnGig can help extend your signal to every corner of your home with a home networking service for only $10 extra per month. Our technicians set up a Wireless Mesh Network to provide great Wi-Fi speeds all throughout your home. If you’re wondering if you need this package, walk around your home with a laptop and run a speed test. If you’re receiving significantly less on the outskirts of your home than you are near the ONT, you may want to upgrade with the home networking package. You can also or contact us for a no cost consultation from our expert technicians. Do the batteries in the ONT ever need replacing? I received a call recently. If you’ve been on the FairlawnGig network for two years or more, your ONT may need a backup battery replacement. Not all do, but for those that need replacing, FairlawnGig’s systems alerts us specifically if your battery needs to be swapped out. The process is quick and easy and won’t require you to be “offline” for more than a couple minutes. If you’re contacted by FairlawnGig, don’t be alarmed, simply let us know when you’d like us to perform the routine maintenance. Where can I find FairlawnGig’s position and policies on things like privacy, security, and even billing policies? FairlawnGig publishes all of our policies to be found online at: https://www.fairlawngig.net/policies/. If you have any questions, contact our customer support team. One of my family’s guilty pleasures during the Holiday season are the Hallmark holiday-themed movies – is there any way I can get these through a streaming service? Where can I find Holiday programming on streaming services? Freeform – Holiday classics, lighthearted holiday fun, and Christmas-themed comedies. Lifetime – Made for TV movies including Holiday rom-coms. AMC – Not surprisingly, you’ll find Holiday classics here like Elf, Christmas Vacation, White Christmas, and Miracle on 34th Street. Netflix – Holiday films and Holiday episodes from your favorite shows. Is there anything I can do to boost my signal strength throughout the house? I’ve been seeing a lot of advertising for YouTube TV and their sports programming – is something new or is it just because the NBA season just started? Already a great streaming television option with countless channels available, YouTube recently announced that the popular “NBA League Pass” is now available. It’s not cheap at $40 a month but it is certainly more affordable than one in-person game to be able to watch each and every non-nationally televised game. YouTube TV also includes the main broadcast networks, ESPN, and TNT so hoops heads can watch every single game of their favorite team, player, or even hate watch the Lakers. With cable Internet, when there is high volume usage, service slows down because of their shared system of subscribers. But would there be cable-like slowdowns in service if FairlawnGig provides service beyond the city? In Fairlawn service is not shared but instead dedicated so there are not slow downs in service during “peak” times. Cable Internet is indeed a shared system, a big pipe serving an area/neighborhood. If you add up the maximum speed committed for all the customers in a neighborhood, the total will be greater than the capacity available on the big pipe serving that neighborhood. This is called oversubscription, and it is normal in traditional cable. Oversubscription allows traditional providers to offer high speed access to many customers on a shared system by relying on the probability that not everyone will attempt to use the system at the same time. Customers using cable Internet will notice slowdowns on the cable system from time to time. You will notice it when the kids get home from school in the afternoon and in the early evening when people get home from work. We’re different: the FairlawnGig residential service is built on a physical network that is a Gigabit Passive Optical Network (GPON). A small bundle of fiber goes to each neighborhood. Within the neighborhood, each of those fibers is split so that it can connect to multiple homes. Within Fairlawn, FairlawnGig has been designed with very low split ratios. In a typical neighborhood, we have 1-by-8 splitters and at most 1-by-16. Normal cable company practice might be 1-by-128 split ratios for residential neighborhoods. The City of Fairlawn “over-designed” the network intentionally. With the low split ratios in the FairlawnGig GPON network, there will never be the slowdowns similar to cable. Every FairlawnGig customer in your neighborhood can be using the network at their maximum access speed at the same time, and no one will notice any slow down or change in their service level. Residential FairlawnGig customers in Fairlawn will always be able to access the Internet at their maximum speed. Adding more customers in or out of Fairlawn will not affect this. As FairlawnGig looks to expand beyond Fairlawn, there will be no impact on anyone’s service in Fairlawn. Any expansion will be done by adding new neighborhoods. Your neighborhood fiber network is already buried in the ground and has those low split ratios forever. Neighborhoods are isolated from one another, so your neighborhood will not change if we add new neighborhoods outside the City. And the neighborhoods outside the City we add will have the same build specifications. How can I get high definition on live local channels? Where do I plug in a streaming box to begin watching programs on a streaming service? Investing in a reliable indoor or outdoor HD antenna will allow your home TVs to pick up free, high definition local programming. You can receive the area’s available free local channels with great reception using an indoor or outdoor HD antenna combined with the tuner on your TV or set top boxes like Roku and TiVo. It’s possible that your current antenna will work just fine to receive the stations you want. It will give you HD reception if it’s an HD antenna. Both outdoor and indoor antennas plug into the “Antenna” (ANT/IN) port on the back of your TV. Do a scan from the TV which automatically finds all the available channels and you’re all set to watch free local TV programming. If you have a Smart TV, you are all set to begin streaming once you choose a streaming service. If your Smart TV is more than five years old, you may want to consider adding a streaming box or stick. You may even find using a streaming box will allow you to stream content even faster than your Smart TV alone. Any TV with an HDMI port will stream from a streaming box or stick. There are many inexpensive options. You can read our articles on streaming hardware here. Once you have your streaming hardware, it’s easy: plug it into the HDMI port on the back of your TV. HDMI ports were installed starting in 2002, so your TV probably has one. If it doesn’t, it’s time to upgrade to a new TV. TV costs are way down. A new TV will be thinner, lighter, use less energy and deliver a great sharp picture whether you’re watching local channels or streaming a movie or TV series. How can I stream Cleveland Indians games with FairlawnGig Internet? You can watch games with an antenna for free on FOX, who has a large contract with MLB, split between their broadcast network and FOX Sports 1. With an antenna, you’ll get 12 Saturday afternoon games throughout the season, the All-Star Game, and a Division Championship game (alternating each year). You can also watch the World Series for free in high definition on FOX. You can also watch the Indians on many streaming services (SlingTV, DirecTV Now, PlaystationVue and fuboTV). We have an overview of streaming services here on our website. Except when there are local blackouts during Indians home games, you have a lot of choices to watch and root for the home team without needing cable. I was wondering about actual house installation. Your articles stated that we would be contacted about the install by the service tech to work out the details. Will this include the install inside the home as well as where the connection is made? If the details we are looking for are not included in a standard installation, what would we do about a custom installation? Is there someone else to contact or would the company doing it simply charge us for the additional items we are considering? When your neighborhood’s fiber construction is complete, prior to your installation, a FairlawnGig technician will come to your home to conduct a survey and confirm where the fiber will enter your house and the interior location of your FairlawnGig ONT. Our technician will advise you on the best location for your ONT and discuss your custom installation plan for installing the fiber into your home. Then, we will schedule an installation appointment for a FairlawnGig technician to return to your home and complete the remaining installation steps, including setting up your home network. Our technicians will be able to perform the entire job and usually there are no additional charges. If you’d like to learn more about the installation process, there is a helpful article here on our website. At the time of your installation appointment, a FairlawnGig technician will run fiber cable into your house from your home’s exterior to the interior room with your new FairlawnGig ONT. Because of the pre-planning at the initial home visit, you can rest assured that everything will go smoothly at the time of your installation, and your FairlawnGig Internet service and home networking will be completely operational before the technician leaves. How do I receive live local channels (3, 5, 8, 19) as well as live cable channels with FairlawnGig? What about traditional cable channels such as ESPN and national news? How do I get these channels and how much does it cost? FairlawnGig enables you to stream your TV content over the Internet. It works great with our super fast and reliable Internet service. TV content is quickly moving to streaming over the Internet—you can be at the forefront of this with FairlawnGig. With a streaming service, you often pay less than you would with a cable company’s TV channel plan. When you switch to streaming your TV content, the best way to get the local channels is with an over-the-air HD antenna. See the tip above from a Fairlawn area resident who uses an antenna. We also have an article on antennas here. There are also streaming apps for the big networks ABC, NBC, CBS, etc. Some of these have live feeds from the local channels. In addition, you can stream the FOX channels, includes FOX Sports Ohio, over the Internet to watch a Cavs game. In our area, live streaming is limited, but will improve over time. At its start, satellite TV did not have local channels but over time they solved that problem. Expect the same to happen here as streaming services reach more deals to distribute content over the Internet. Two streaming packages that are similar to basic cable’s channel lineup with 100 channel packages are SlingTV and DirecTV Now. You get CNN, ESPN, Golf Channel, MTV, Bravo, TNT and more that way. PlayStation Vue is another streaming service option. Find articles on these three services here on our website. New streaming services are being added at a rapid rate. For example, YouTube will soon be offering a live streaming package at $35 a month. With a streaming service, you end up having access to more channels and more content, but it is different. And you may have to combine several services and the HD antenna and other apps to build a 100% replacement for cable TV or satellite TV packages. But it’s also likely that you will spend less than your current cable TV package. We have a streaming set-up in Fairlawn’s Service center and you are welcome to come in and try it out. We have a Smart TV, an Apple TV set-top box, and an indoor HD antenna all hooked up to FairlawnGig. Let me know if you would like to stop by and we will make sure someone who is knowledgable about streaming can talk to you. If I sign up for one data plan, and then decide that I would like to change my plan, will there be any penalty for doing this? I wasn’t sure that once you acquire service if you could either upgrade or downgrade your service. You may change your FairlawnGig service plan without penalty by calling our main number. Usually, we can make the change to your service level within 48 hours. Once the change is made, we ask that you stay with your new plan for one full month. I am switching my phone service from TWC to FairlawnGig. TWC has the ability to block calls from most robocall (computer auto-dialed) services. Does FairlawnGig's phone service have call blocking capability? A: The FairlawnGig phone service is configured to block robocalls across the entire system. Customers do not need to configure anything to make this happen. Once you begin the FairlawnGig phone service, let us know if you are getting unwanted robocalls and we will add them to the blocked list. When the fiber optic line comes to the house, does it stay as a fiber optic line all the way to the modem? A: Yes. Your connection to FairlawnGig is entirely fiber from our data center to the FairlawnGig ONT inside your house. A fiber service drop is run from a pedestal in the street to a box on the side of your house. When the crews come to install service at your house, they run a fiber cable into your house from that box to the location where you want the ONT. The ONT converts the optical signals (light) on the fiber cable to Ethernet and WiFi inside your home. When your home is connected to FairlawnGig, there is a continuous strand of fiber that runs from the ONT in your house all the way to the FairlawnGig data center. Read more about the installation process here. Is there a data cap monthly for residential usage? There are no data caps in the FairlawnGig system. Residential and business customers are able to access the system at their service plan speed, and there is no maximum amount of data that they can transfer in a given day, week, or month. Does the home ONT have a battery backup for power outages? I plan on getting the phone service FairlawnGig is offering and want to make sure it will stay on in the event of a power outage. An Uninterruptible Power Supply (UPS) is included with FairlawnGig residential installation. The UPS has a battery that will power the ONT for up to eight hours in the event of a power outage. The FairlawnGig Data Center has a comprehensive power backup system that will keep the entire network running through any type of power outage. In the event of a power outage at a residential customer’s home, both the Internet access and phone service will continue to operate. The included UPS supports only the FairlawnGig ONT. If you have other network equipment in your home that must be available during a power outage, a separate UPS is recommended for those devices. Will the speeds for bi-directional uploads and downloads only be realized for hard-wire (direct) attached devices? All our access is through a residential wireless router. Will our performance be limited to the transfer speed of the WiFi? Both wired and wireless devices will be able to take full advantage of the fantastic FairlawnGig speeds. Residential routers today include Gigabit Ethernet which is an exact match for FairlawnGig’s Gigabit service level. On the WiFi side, the speed will be variable depending on the type of wireless device. A laptop computer can communicate at more than a Gigabit per second with the latest WiFi technology 802.11ac. This great WiFi performance is possible with a modern laptop in the same room as a new WiFi router, perhaps 12 feet away. Moving to the next room, the WiFi wireless communications speed will be something like 867 Mbps. Across the house and down in the basement, the laptop might get 300 Mbps wirelessly to the WiFi router. Wireless connections can take advantage of the full speed of FairlawnGig, but the performance will be more variable than wired connections. Wireless performance varies with location and with different device types. Laptops, SmartTVs, streaming media boxes like Roku and AppleTV and other new devices will get similar performance to what is described above for the laptop. An iPad might start out at 350 Mbps in the same room with the WiFi router and drop down to 100 Mbps a few rooms away. A smartphone may be a little less than that. An eight-year-old Nintendo DS never communicated over WiFi at more than 5 Mbps; it will still work with a modern WiFi router at 5 Mbps. Also, all of the FairlawnGig service offerings are symmetric—the same speed up and down. Ethernet wired connections and WiFi wireless connections work this way. All of the devices in your home will be able to take advantage of the great speeds available with FairlawnGig. The FairlawnGig ONT is included with Residential Service. It is described in detail here. This includes a WiFi router that is probably better than the one you are currently using, and we recommend using it to get the best performance from your WiFi devices. When we come to discuss your install, FairlawnGig technicians will discuss your home network and can help you decide whether it is better to use our AP, use your old AP or use both to get the best performance for all your devices. When should I cancel my current cable service? How can I prevent getting locked into a contract with my cable provider before I switch to FairlawnGig? We recommend that you cancel your Internet service right after your FairlawnGig installation is complete so your Internet service is not interrupted. If you are planning to switch to FairlawnGig, check your bill from your current service provider to see if there are any cancellation fees. Residential customers usually do not have any contracts with their service provider or early termination fees. Business customers usually do have contracts with their Internet service provider. If you are a cable customer, you might choose to keep your TV service through the cable company but use FairlawnGig for Internet access. In that case you would contact the cable company and change your service as soon as FairlawnGig is installed. How does EMAIL work with FairlawnGig? Do I need to get a new EMAIL account? FairlawnGig does not offer EMAIL accounts. Your existing EMAIL accounts will work with FairlawnGig. Unless your existing EMAIL account is tied to your current Internet service provider, there is no need to get a new EMAIL account with FairlawnGig. If you are using your existing cable provider’s EMAIL service, you should create a new EMAIL account and transition to using the new EMAIL. There are several free EMAIL services that you could use for a new EMAIL account including Google’s gmail, Apple’s iCloud, or Yahoo! mail. These can be easily configured to come into your computer’s inbox, they work well with mobile devices, and can accessed on the web from anywhere online. In today’s world of convenient, secure, free webmail, there’s no reason to be stuck using one tied to a cable provider that disappears when you change Internet providers. Start your transition now by changing your contact email on your online accounts, such as banks and credit cards. Will each home/business have conduit and fiber optic cable installed from the street to the home/business? No. The FairlawnGig network is being built down each street in the right-of-way, and it passes every residence and business in the City of Fairlawn and the Akron/Bath/Fairlawn JEDD. Fiber is only run from the street to the home or business for those who sign up for the FairlawnGig Service. If you sign up for FairlawnGig service, fiber will be run from the street to a box on the outside of your house. Do the routers in each home/business work with fiber optic cable instead of coax like Time Warner Cable? Yes. FairlawnGig residential service includes a box that interfaces to the fiber optic cable—the FairlawnGig ONT. There is an article describing the FairlawnGig ONT in detail. It is the box that replaces your cable modem. The FairlawnGig ONT includes the Optical Network Termination, a four port gigabit Ethernet switch, a state of the art WiFi Access point and a home router/firewall. Will there be data caps with this service? There are no data caps with FairlawnGig residential or business service. And there will be no data caps with the FairlawnGig secure wireless service when that rolls out. When can I get rid of the little flags and paint in front of my house? What should I do with the flags? 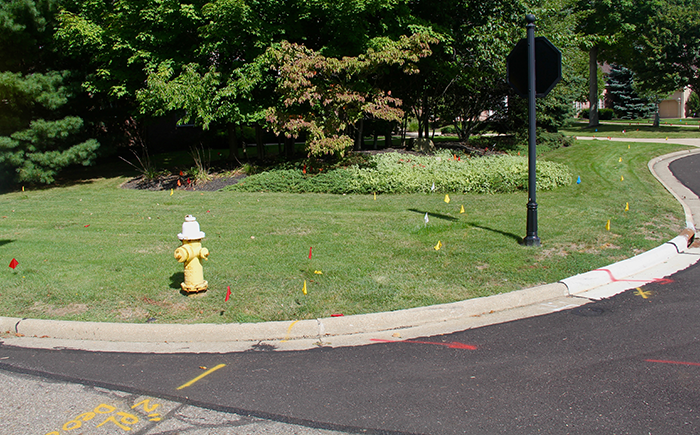 The flags and paint are used to show the location of existing utilities in the right of way. Our construction crews need this so they can avoid disrupting other services when they are digging in the right of way to install FairlawnGig fiber. Please don’t remove the flags or change their location. After the conduit is installed, crews will pull fiber through the conduit and then install service to individual houses. We need the markings to remain until the crews are finished pulling the fiber and connecting to homes on your street. The City will remove the flags and any paint remaining after the construction is complete on your street. Your map shows twelve neighborhoods defined and you have said that the FairlawnGig fiber network will be built neighborhood by neighborhood. How did you decide which neighborhood gets service first? How did you pick the order of neighborhoods to be built? A: The City of Fairlawn is investing in FairlawnGig as essential infrastructure for the community. The City has committed to pay for the construction of the entire FairlawnGig network that will pass every door in the City and the Akron/Bath/Fairlawn JEDD. This enables the construction of the FairlawnGig network to be done in a unique way. Unlike most large telecom projects, we are not building the network based on politics. We are not building the network to reach high-value commercial customers first. We are not building the neighborhoods based on demand. We are not building the network in a piecemeal fashion. We are building the whole network as quickly and efficiently as possible. The City has asked its design build partner, Fujitsu Network Communications, to build the network in the most cost effective manner and as quickly as possible. Decisions about how to build the core fiber ring, or which neighborhood is connected to the network first are entirely driven by what’s best for the construction process. Many neighborhoods will have Internet service beginning in 2017, and the entire network should be built by Fall of 2017. We will update the map here to show the construction progress and when your neighborhood has service. If you signed up for service on our website, we will be in contact to get you connected as soon as it is available on your street. Sign up for service here if you haven’t already done so. I’ve noticed the crews installing conduit and even talked with them. How soon after the conduit is installed will the fiber cable be laid within the conduit? Pulling the fiber cables through the conduit is much faster than installing the conduit. While it may take several weeks to complete construction of the conduit for a neighborhood, the fiber cable can be pulled through the conduit and splitter cabinets installed to service the whole neighborhood in a week. There may be multiple fiber cables running through the conduit and each cable has a bundle of many fiber strands. The cable for the core ring has over five hundred strands of fiber. As the cable runs out into the neighborhoods, the cable is split into smaller and smaller bundles of fiber strands. This fiber optic cable configuration is a custom design for Fairlawn and must be special ordered. We are waiting for this cable to be manufactured now for the first three neighborhoods. Will there be crews coming back through to landscape where the conduit and boxes were installed? Yes. After the holes are dug for the boring, construction crews will put the dirt back, fill the hole, put the grass back on top, and clean up after themselves. Once the underground construction is complete in an area, City of Fairlawn crews will restore the landscaping to City of Fairlawn standards. Is there a plan for returning the landscaping around the city to what it looked like before the holes were dug for the fiber? Yes. While our fiber construction crews do their best to disturb as little as possible while doing their work, we understand residents’ concern that the landscaping is not yet back to its original, pristine appearance. Now that the calendar has turned to May, we can begin to replant flowers, restore the grass, and repair the concrete and asphalt. The fiber boxes and their hand holes can now be straighten and leveled. 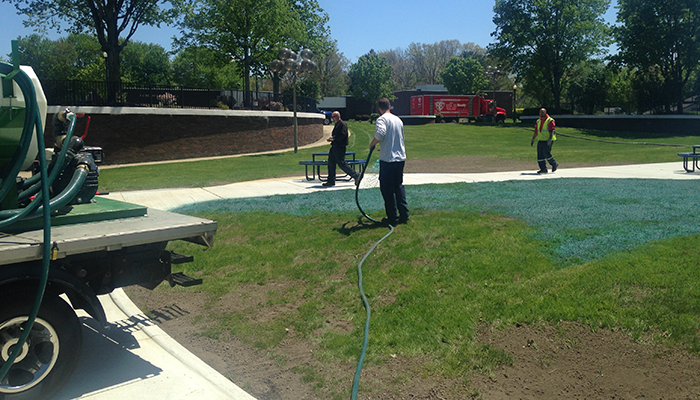 City of Fairlawn landscaping crews are restoring a lawn after FairlawnGig construction. We have already begun the restoration process; the plan is to start and continue in the order where construction began: the first neighborhood where construction started will have the restoration done first. Restoration of all the neighborhoods will continue to be done in that order throughout the city. Restoration of private property and the right-of-way will be done directly by the City of Fairlawn Service Department. We will restore private lawns and landscaping to their original state, and anything in the right-of-way areas to the City of Fairlawn’s high standards. By the end of the summer, we will have completed the landscaping restoration and everything will be back to normal. Bringing FairlawnGig’s fiber Internet service to fruition and constructing the network has been a complex undertaking, but one that yields a real asset for both residents and businesses. Fairlawn residents can expect our fiber network to positively impact real estate value: read more here. We are delivering an unprecedented Internet experience coupled with responsive customer service. All of FairlawnGig’s Internet services and management is local, keeping it wholly invested in our community. You’ve come to expect top-notch city services in Fairlawn, and the restoration results will be no different. Thanks for your patience. Q: I’ve noticed a lot of FairlawnGig network construction around town. Some of the construction areas are messy. Who is going to clean this up and when? Will the City take charge of getting the lawns back to what they were before digging began? What about those boxes, will they be level and straight? Construction of the FairlawnGig network is continuing at a rapid pace this winter all around Fairlawn. We try to give residents advance notice of when construction crews will be coming down their street. In some cases the construction crews were ahead of schedule and we did not provide advance notice before construction began. However, I am working with the construction crews and we will give residents better notice going forward. Our fiber construction crews do their best to disturb as little as possible while doing their work. When left unattended, construction areas including the holes and boring equipment should be fenced off for safety reasons. Notify me immediately if you find a construction site where this has not been done. The construction crews are aware that all of the hand holes must be level and the utility boxes must be straight and level. This is difficult right now during the freeze, thaw, freeze, weather that we are having. Everyone understands that I will not sign off on the construction until all of this is straightened out. We are waiting until the weather stabilizes before doing this so we can avoid having to fix the same locations multiple times. Restoration of private property and the right-of-way will be done directly by the City of Fairlawn Service Department. We will restore private lawns and landscaping to their original state, and anything in the right-of-way areas to the City of Fairlawn’s high standards. Final restoration cannot be completed during the cold weather. As soon as the weather breaks, the concrete, asphalt and landscape restoration will begin. Sorry about the mess. Thanks for your concern. By the end of the summer we will have gotten everything back to normal. We have a sprinkler system in our yard. How do you avoid the sprinkler when digging? Will we need to have sprinkler company mark the yard? Our construction crews are aware that many Fairlawn residents have underground sprinkler systems and will avoid disturbing them if at all possible. The main FairlawnGig construction along your street is much deeper underground than sprinkler systems, so that is usually not an issue. If FairlawnGig construction is on your side of the street and if you have sprinklers within fifteen feet of the street it is a good idea to let us know that you have sprinklers. The best way to protect your sprinkler system is to mark the sprinklers yourself before FairlawnGig construction begins on your street. If your sprinkler company doesn’t do this or you are unable to do it yourself, call the Fairlawn Service Department at 330-668-9550 and we will send a crew out to locate and mark your sprinklers for you. 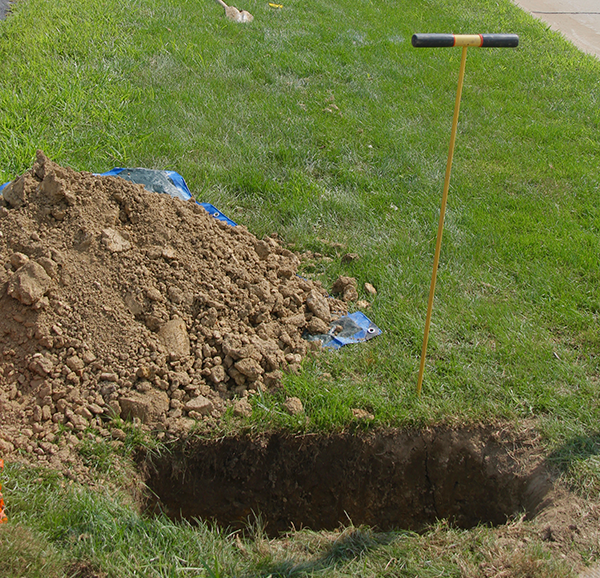 If you are taking FairlawnGig service, we will install a fiber “drop cable” from the street to your house. This will definitely cross your sprinkler system. When you are scheduling your install, let us know that you have sprinklers, and we will make sure the construction crews are aware so they can avoid damaging your system. If damage to your sprinkler system does occur as part of FairlawnGig construction, the Service department will repair the damage and restore your lawn to its original condition.